The footnote for this refers to “From USAF intelligence report. (See also Ruppelt, Edward J., op.cit., p.
Then, slowly, sightings began to increase. One new and important report came from the guided-missile tracking base near White Sands, New Mexico. On the morning of July 14, two radar operators caught a fast-moving object on their scope. 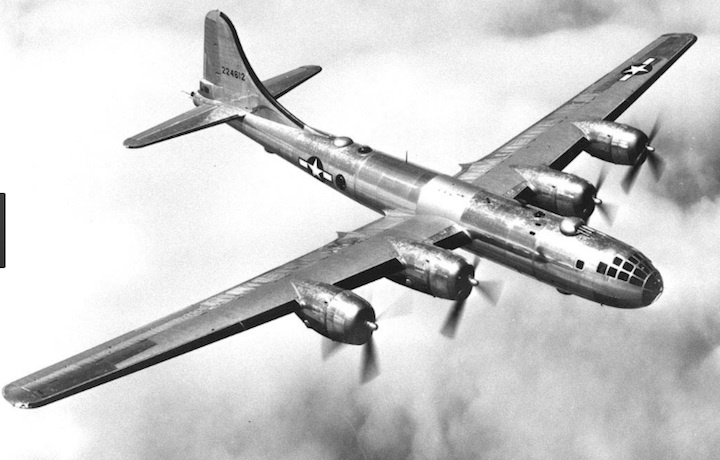 At the same time a tracker watching a B-29 with binoculars saw a large UFO near the bomber. Another observer quickly lined it up with his 35-mm. camera, then shot 200 feet of film. Because of the high altitude, the saucer showed only as a round, bright spot. But at least it was proof—this was no hallucination. The July 23rd date is nothing more than a double entry and should be deleted from the best evidence. • 7:55 AM local time: Two F-86s on patrol over Long Beach see a UFO above them “high at twelve O’clock”. Ground control had no radar contact. F-86s start to climb. F-86s attempted to reach the UFO but it was too high. Described object as a “silver airplane with highly swept back wings”. • Four more F-86s showed up and relieved the first two. They could not reach the UFO either. They estimated its altitude at 55,000 feet. The UFO appeared to speed up as the F-86s got close. • One more F-86 was sent up to relieve the four, which were running out of fuel. By the time he arrived on station, the UFO had vanished. All of the pilots, with one exception, gave the description of a plane with swept back wings. The pilot, who gave a different description, stated the object was round and silver. almost directly at the balloon. But from then on, even by altering the course of the F-86’s, I couldn’t prove a thing. • Blue Book notes that there was no radar contact contrary to what NICAP reported. • At 0810 or 0815, the two F-86s left the area short on fuel. • The description was of a swept wing aircraft with the wings swept at 45 degrees. • At 0800, the four F-86s arrived in the area and split into two elements of two aircraft each. • At 0925, the second element returned to base. They described the object as silver and round. • The weather balloon, that was supposedly the target, was released at 0700 and was lost from view by the observers at 0743. • The track of the weather balloon and aircraft was plotted by Blue Book. • The speed of the object was described as “not too fast” by one of the pilots. • No test aircraft were airborne at the time. • The weather balloon released from Long Beach was lost at 42,900 feet due to “mechanical difficulties” and was last recorded ascending at 1000 feet/min. • Captain Guthrie, who was in the flight of four F-86s, stated in his interview that he thought it was a weather balloon. • Captain Harvey, who was in the flight of four F-86s, stated in his interview that it could have been a weather balloon. • Captain Reichman, who was in the first fight, thought it was an aircraft conducting a burn. • There was no indication that the weather office had reported the balloon bursting in their report. Instead, they simply state they lost track of the balloon at 0743.
object was not the weather balloon launched from Long Beach. T o me, the report sounds more like a large research balloon and not a weather balloon. A research balloon in the sky would have been illuminated by the rising sun (having risen around 0645) and presented a “teardrop shape”. This could have been interpreted as an aircraft with swept back wings when viewed at the right angle. The altitude of 50-55,000 feet was only an estimated altitude and it could have been higher. The biggest source of research balloons in 1951 was Holloman AFB. They have pretty extensive records of balloon launches and there is a potential candidate. On September 21, 1951 a balloon was launched but, after reaching 96,000 feet and 16 hours of flight, they lost track of the balloon.11 The table states there was a separation failure (the payload never was released) but the balloon performed satisfactorily. The balloon, and its payload, were never recovered. In 1962, A. D. Belmont, of General Mills, produced a report for the Office of Naval Research, with the title, “The stratospheric monsoon”. Based on this information, it appears that the change occurs around the fall equinox and indicates that it is probable that any stratospheric balloons launched before the 23rd would have drifted towards the west. Long Beach is about 700 miles distant from Holloman and at an azimuth of about 278 degrees. Assuming the balloon was launched in the morning, the balloon would have traveled at roughly 15-20 mph (13-17 knots) if it took a direct route. This is well within expected wind speeds for the stratosphere. The tracks of the aircraft attempting intercepts indicate the balloon was drifting towards the NorthWest. The track (in red) is only an approximate one based on the actions of the three different flights of aircraft. While the pilots described themselves cruising directly beneath the object in an orbit of some kind, it is possible it was their own motion that gave the impression that the object was in an orbit. They may have overshot the target and were circling back to reacquire it. 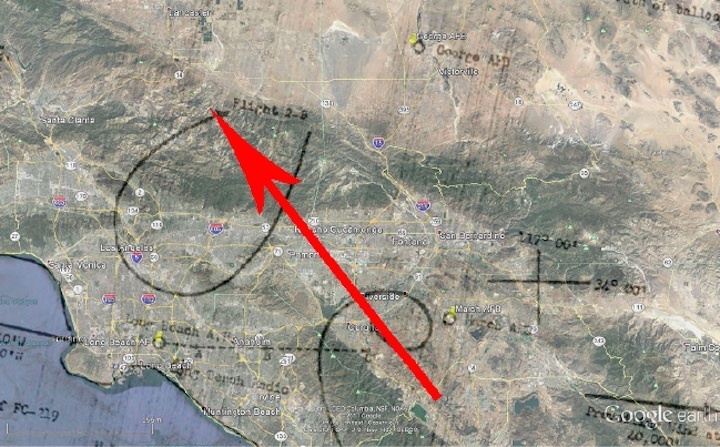 To drift to the Long Beach area from Holloman, the balloon would have been on almost a westerly course (azimuth 278-280). While, this track indicates a more northwesterly course, a change in the direction of the balloon from West to NorthWest is not that surprising. The stratospheric winds could have begun its autumnal shift towards the east or the balloon could also have been losing altitude at this point in its flight. As it decreased in altitude, the lower stratospheric winds could have shifted towards the northwest. 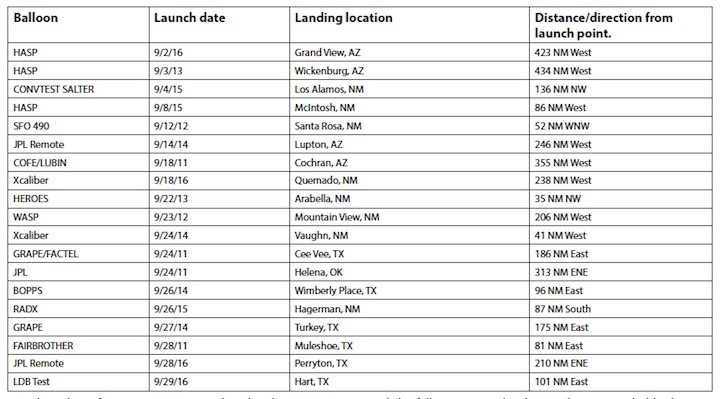 I want to think that the weight of the evidence suggests that the likely source was the Holloman research balloon launched on September 21st. However, the evidence is not as firm as I would like. We don’t have any good data about the balloon other than it was launched on the 21st, ascended into the stratosphere, and was never recovered. The rest is all about the probability of it reaching Long Beach in two days. With that being said, it is my opinion that the Holloman AFB research balloon is more likely than something “unknown to science” hovering over Long Beach that morning. The case cannot be considered “best evidence” and should be discarded.